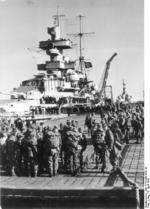 ww2dbaseNamed after Admiral Ritter von Hipper, the heavy cruiser Admiral Hipper was also the lead ship of her class. She participated in the invasion of Norway and battled British destroyer Glowworm off Trondheim on 8 Apr 1940, in which battle the British destroyer suicidally rammed Admiral Hipper before going down below the waves, causing severe damage. In the early hours of the next day Admiral Hipper entered Trondheim harbor and unloaded the invasion troops aboard, taking control of the city. She received repairs at Trondheim, and joined Scharnhorst and Gneisenau in patrolling the waters off Norway. She spent two months in late 1940 in the shipyards at Kiel and Hamburg for repair and overhaul. ww2dbaseAfter being activated for service again, Admiral Hipper became a merchant raider operating out of Brest, France. In the two months she acted in this role, she damaged three (two merchant ships and one cruiser, HMS Berwick) and sank seven ships. ww2dbaseOn 28 Feb 1941 Admiral Hipper returned to Kiel via the Denmark Strait, then headed back for Norway for patrols there against Arctic convoys. On 31 Dec 1942, she participated in the failed attack on the convoy JW-51B, which was later named the Battle of the Barents Sea. She received damage during the battle and was returned to Wilhelmshaven and decommissioned. She was used little for the remainder of the war, the only significant action involved evacuation of German soldiers from the eastern shores of the Baltic Sea. ww2dbaseAdmiral Hipper was scuttled at Kiel on 2 May 1945 immediately before Germany's surrender. 29 Apr 1939 Admiral Hipper was commissioned into German Navy service. 18 Feb 1940 German heavy cruiser Admiral Hipper embarked on Operation Nordmark, aiming to intercept British convoy traffic in the North Sea. 8 Jun 1940 During Operation Juno, German cruiser Admiral Hipper sank British tanker Oil Pioneer and escorting armed trawler HMS Juniper; 20 were killed and 29 survivors were captured by the crew of Admiral Hipper. Admiral Hipper moved on to sink troop transport Orama; 19 were killed and 280 survivors were captured by German destroyers. When Admiral Hipper encountered hospital ship Atlantis, she allowed her to departed unsolicited. 20 Jun 1940 German battlecruiser Gneisenau and heavy cruiser Admiral Hipper departed Trondheim, Norway for operations near Iceland as a diversion for battleship Scharnhorst's cruise to Kiel, Germany for repairs. 7 Dec 1940 Admiral Hipper departed Kiel, Germany for an anti-shipping sortie in the Atlantic. 24 Dec 1940 German cruiser Admiral Hipper detected Allied convoy WS.5 700 miles west of Cape Finisterre, Spain late in the afternoon. The convoy was consisted of 19 troopships and freighters; not noticing that it was escorted by two carriers, three cruisers, and four corvettes, the German commander Admiral Wilhelm Meisel prepared the crew for an attack in the morning. 25 Dec 1940 German Admiral Wilhelm Meisel aboard cruiser Admiral Hipper ordered an attack on Allied convoy WS.5 in the morning, taking advantage of mist and rain; the convoy had been detected on the previous day and the ship's crew had been shadowing it through the night, but failing to realize it was heavily escorted. At 0808 hours, Admiral Hipper fired on troopship Empire Trooper (16 soldiers killed) and freighter Arabistan, but she was soon chased off by a corvette and three cruisers. In retreat, Admiral Hipper fired at her pursuers, striking cruiser HMS Berwick at the rear gun turret, killing 4. Carriers HMS Argus and HMS Furious launched aircraft to hunt for Admiral Hipper as she retreated toward Brest, France for repairs, but the German cruiser would not be found. Later on the same day, 150 miles to the east, Admiral Hipper detected and sank British ship Jumna; 111 survivors in the water were left to drown. 27 Dec 1940 German cruiser Admiral Hipper arrived at Brest, France, ending an one-month patrol in the Atlantic Ocean. 11 Feb 1941 German cruiser Admiral Hipper sank British ship Iceland of Allied convoy HX53 800 miles west of Gibraltar; the entire crew of 23 survived and were picked up by Admiral Hipper. Admiral Hipper would soon detect the rest of the convoy on radar at the distance of 15 kilometers. 12 Feb 1941 German cruiser Admiral Hipper attacked Allied convoy HX53 800 miles west of Gibraltar at 0618 hours, sinking 7 ships (British ships arlaby, Westbury, Oswestry Grange, Shrewsbury, and Derrynane; Norwegian ship Borgestad; and Greek ship Perseus). At 0740 hours, Admiral Hipper broke off the attack as rain helped the remaining Allied transports escape. Admiral Hipper had nearly expended all of her 203-mm shells in this attack. 15 Feb 1941 German cruiser Admiral Hipper arrived at Brest, France, after a short but successful cruise that sank 8 Allied ships totalling 34,000 tons. 28 Feb 1943 Admiral Hipper was decommissioned from service.